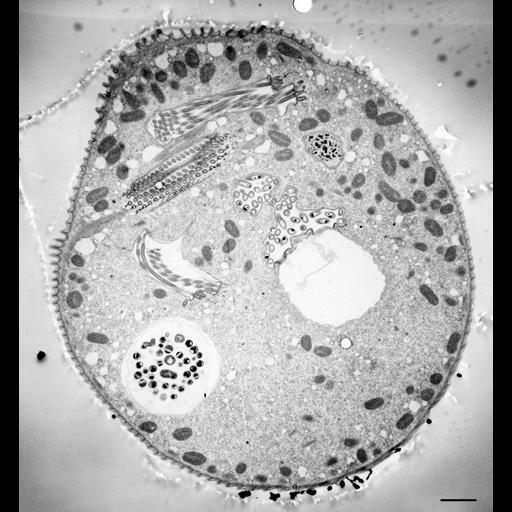 The 11 micrographs of the group are views of a serially-sectioned contracted Vorticella convallaria cell that show the main features of this cell. This figure shows 1 food vacuole; micronucleus; contractile vacuole connected by 2 CV pores to the bacteria-filled chamber; peristome; perikinetids of the perioral cilia. TEM taken on 4/1/71 by R. Allen with Hitachi HU11A operating at 75kV. Neg. 3,400X. Bar = 2µm. The negative was printed to paper and the image was scanned to Photoshop. This image is suitable for qualitative analysis. A high resolution version of this image in the library (CIL:40570) is available for quantitative analysis. Additional information available at (http://www5.pbrc.hawaii.edu/allen/).